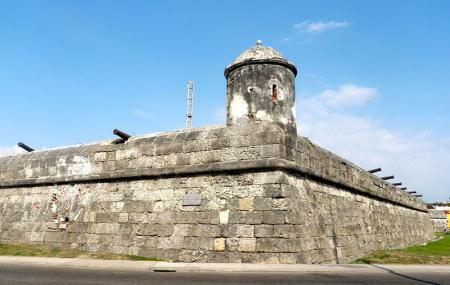 Though there are many bastions protecting Cartagena, this one is special. It was here that the first construction on the city walls of Cartagena began in the 17th century. Construction began here as this was the location where Drake had begun his attack in 1586. The style of military fortification is Italian. The top of the bastion has now been taken over by the Cafe del Mar; however, the cannons remain in place. Even if you don’t come up here to eat, visit for views of the coast and the Caribbean Sea. Spend a few moments pondering what an intimidating sights the bastion must be. Some people say this bastion has the best sunset views of any spot in Cartagena. Good place to go and have some drinks, and if you want to dance have to come here and listen to the live salsa band, one of the best places to go. I saw a beautiful woman here. We saw each other but I was here for work and she was on vacation with her boyfriend. She had a great smile and beautiful eyes. Also a great sunset spot. Get there about 5 for a table. Music is a generic beat and service is slow because they have 10 waiters for 500 people, but still can't beat it. A classic. Hope to see her again. I was planning to watch sunset here, but it was cloudy with gust of wind. Still good view!